UTLA is helping parents organize protests on May 4 at schools throughout the district, and in a letter more than 500 charter school parents are asking to stop it. The Reclaim Our Schools protest is part of a nationally scheduled demonstration for Wednesday, and UTLA says 80 cities and counties have signed up to rally against a proliferation of charter schools. Meanwhile, in front of the UTLA offices, an enlarged letter from charter school parents asked that the teachers union stop the protest. 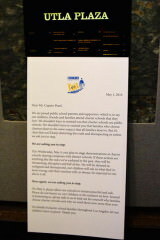 The letter was signed by 527 charter school parents and was put out for display at various entrances of the offices on Wilshire Boulevard. About 170 LA Unified schools and 20,000 people in 40 cities took part in a similar “walk-in” on Feb. 17 and did not disrupt the school day, according to Caputo-Pearl. The demonstrations took place well before school started and included speeches from students, teachers, politicians and community activists. At Hamilton High School, school board president Steve Zimmer spoke as well as Los Angeles City Councilman Paul Koretz and American Federation of Teachers president Randi Weingarten. The protesters said that they want to focus “on the need for full staffing or stopping a potential co-location.” The co-location issue erupted recently at a school in Chinatown over a charter school asking to use rooms in the traditional school under the Prop. 39 state law.